Many people want their aquaponic system these days, and it is no wonder. Imagine being able to grow both plants and fish in a clean, closed system with very little work. Add the enjoyment and fun of raising fish and your favourite hydroponic plants by utilizing a natural cycle, and the popularity of home-scale aquaponics becomes clear. However, pre-made, professional aquaponic systems can be really expensive. That is why many enthusiasts have resorted to creating their own aquaponic setup. The results are really diverse and creative. Not all aquaponic setups are made completely from scratch. Many people already have a fish tank, and are looking for a way to upgrade it to an aquaponic system. The aquaculture component is an aquarium featuring four goldfish. The corner pump brings the water upward to the plant bed - a common window still elongated pot containing the hydroton medium. The interesting twist is that the grow bed input pipe is completely snuggled into a standard aquarium filter floss, which acts as a filter (the author also states that there are wiggler worms living inside it, though they are not shown), plus ensures gentle flow of the grow bed. The system is equipped with a timer that enables the water to flood the grow bed every 15 minutes. The water is drained back into the fish tank. The system uses additional lightning for both tank and the plant bed, and an improvised aluminum foil light box for increased plant growth. Therefore, it is designed and ideal for places with low or no natural light, i.e. your garage. Another tank-upgrade system - an aquarium of only 10 gallons is a home for the fish, and a simple matching PVC pipe with end caps plays the role of a hydroponic plant bed. Because it is so simple, cheap and affordable, it makes a great first try at aquaponic, and a good opportunity to educate children in your home on your class about the natural nutrient cycles. Note that small tanks (and thereby the entire aquaponic systems) are prone to chemical instability, which may endanger both fish and plants. This project was up and running for two months before the blog was written, so despite the risk it has passed the first test of functionality. This is a simple two-component aquaponic system, based on the utilization of an IKEA-style wire baskets. Its compact size makes it ideal for apartments and other small spaces. The smaller, upper basket is used for housing plants, and the lower, deeper one for housing the fish. The two are connected through a corner water pump in the fish tank, and a siphon leading to the plant bed. With the help of a valve constructed within the pipe, half of the water is immediately returned to the fish tank for increased aeration. The grow bed is emptied through a bell siphon. 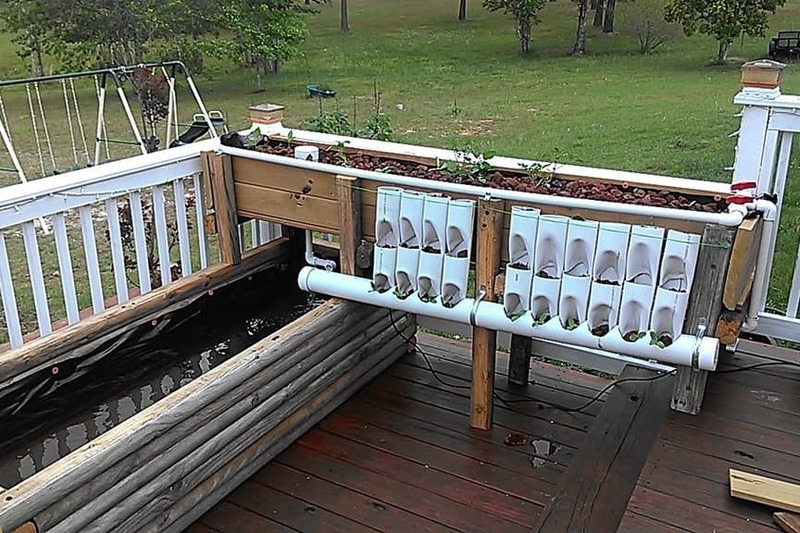 You probably never dreamed that you can build your aquaponic system in mere 10 minutes. But it can happen, claims the MADE Growing Systems crew, an innovative aquaponics design startup from Philippines. The specific Eurocrates the maker uses perfectly fit in together, so this project looks a bit like a cross of aquaponics and giant Legos, doesn’t it? You can find the more quality footage (only in Filipino) here. Water dispensers are made out of clear PVC and have two levels - which gives one a good predisposition to become a small countertop aquaponic system. The project by George Chaw uses an old dispenser he got from his friend. 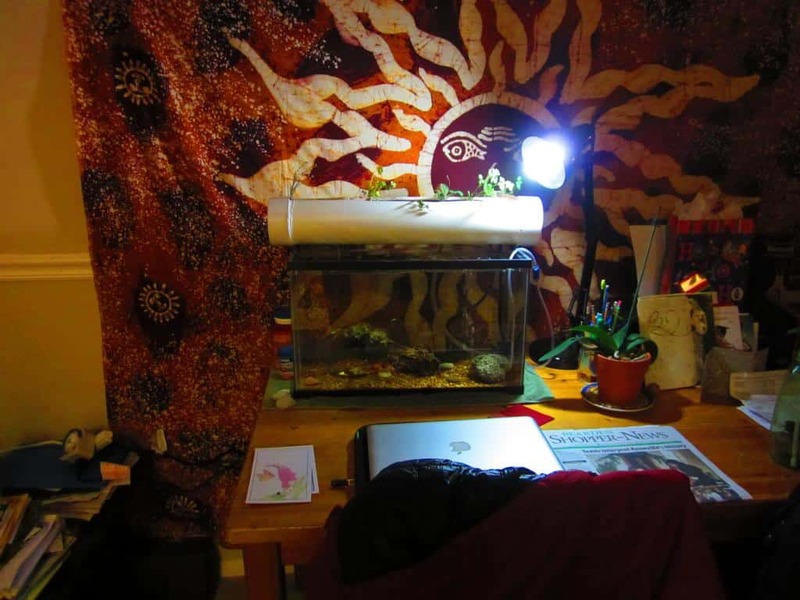 He repurposed it to grow 4 herbs and one male betta fish on his kitchen counter. As for power tools, this project requires drilling only one hole for the aeration tube which houses the water pump hose. When the air is pumped, the water overflows in the upper part of the tube and fills the grow bed. The whole project had cost Chaw around 35$, making it the most affordable on the list. 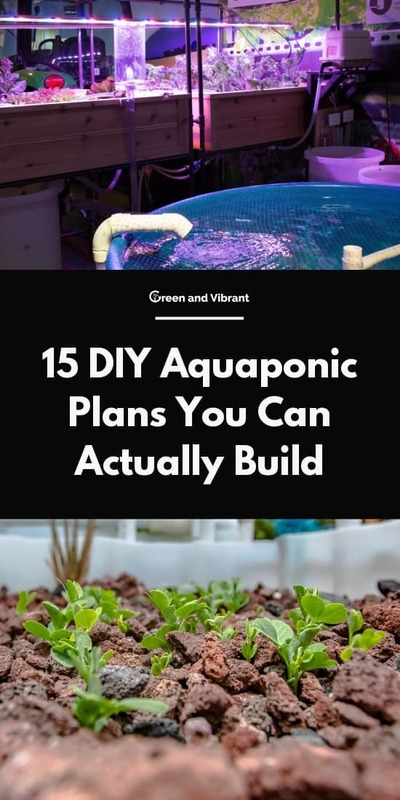 What discourages many people for trying to make even a very basic, experimental aquaponic design is the fact that most plans include a need for electric power, with pumps running all the time. Some are scared of raising their bills, and some simply don’t have a power outlet in the spot that is otherwise perfect for their project. JT Bear offers this simple solution, powered by manual work. A repurposed plastic coffee bin holding plant is filled by water from the tank by hand. Then the, water is slowly released back into the tank via a small hose drilled into the bottom of plant bed. Note that this is a rudimentary plan which lacks a filter and regular water flow, and therefore may be unstable, but it does offer complete independency from a power supply. Good to know! Intermediate Bulk Containers or IBCs are a choice of many aquapon makers, because it is the one of more inexpensive vessels which can hold a large body of water, standing in a sturdy metal frame. Rob shows you how to create a two-part aquaponic system out of one of these containers by cutting it in half. Two thirds of the volume are used as an aquaculture tank, and the remaining one third becomes the plant ped. The tutorial features highlights which you can truly learn from, like detailing on how to make a neat bell siphon, how to deal with leakage and prevent rust, advice on how to avoid algae growth on the surface of your hydroponic medium, etc, so it is worth watching. This is a small scale project suitable for your balcony or a small garden. What I especially like about this system is that it uses a 125 gallon DIY wooden crate made out of thick plywood and equipped with a plastic pond liner (for more details about the crate, see the author’s previous video). For all of you environmentally concerned about plastic, this project uses the minimum amount of it. Also, the color of wood gives the setup a nice natural look, and along with the duckweed makes it really decorative if you like the natural-rustic feel. As for the system itself, the water is pumped from the tank and delivered to the growth bed through a self-made PVC pipe spray bar. The water goes back to the tank via a simple PVC drain, which is covered by a simple filter box to keep out the substrate from clogging the pipe. Difficulty level Easy (if you have a pre-made wooden box) to Medium (if you are building your own). This project has an interesting background. The author was prompted to get into aquaponics since he got tired of fire ants nesting in his raised beds and destroying his crops. The centerpiece of the project are the adapted wooden raised beds - adjusted, resized and lined with pond liners to get them to hold water, which makes it similar to the already described system by Tazawa Tanks. The fish tank holds 200 gallons, and features goldfish. Through the all-around piping structure the water is pumped from the tank into the main plant bed (also a wooden one lined with pond liner), as well as the additional strawberry towers. Another interesting project by Rob shows how to create multiple plant beds out of barrels that all drain through one bell siphon - useful if you consider that bell siphons are a bit tough to make and run properly. Rob dedicated the setup to growing some hydroponic ginger. As the author Kirsten Bradley notices, due to many food-grade plastic vessels and tubing, most aquaponics systems look sort of sterile and clinical (though that can be charming in it’s own way). Also, the same elements that are responsible for that look may be a concern to those among you who are looking to avoid plastic for environmental reasons. That is why for this project Kirsten coupled with Charles from Ecolicious to create a real, dug-out pond for aquaculture, connected to a plant bed made out of a repurposed old bathtub. 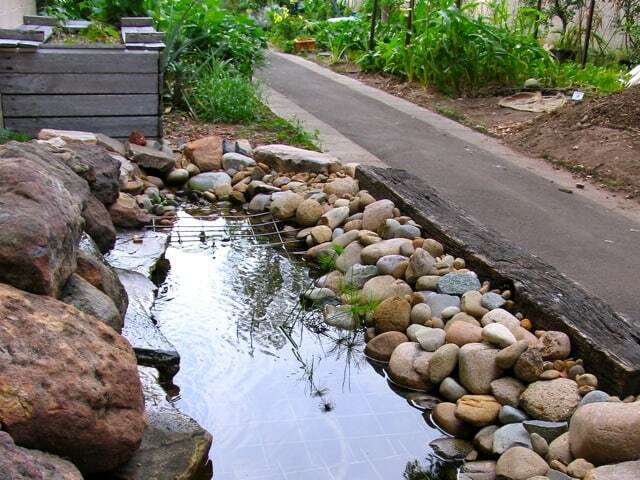 Since the project only utilizes the plastic pond liner and some tubing, plus uses upcycled 20mm clay roof tiles and river pebbles as the hydroponic medium, it is one of the most recycle-friendly, environmentally-conscious projects on this list. Tower systems save so much space, plus they look quite futuristic. This particular tower aquaponic system goes a step further by looking the resolve one of the regular challenges of aquaponic practice - power usage. The solar-powered tower system looks to go off grid by utilizing two solar panels. In this small scale experimental design, the grow towers are settled within a greenhouse shelter / grow tent, with the solar panels sitting just outside. The water from a simple 100-gallon plastic tank is pumped to the top of the tower, runs through them watering the roots, and then trickles back to the tank through the designated ditches. Conveniently, the towers are hung on a pole, and can be detached from it and carried away (to the kitchen, market, etc. ), and then hung back on. If installing solar panels is not an option for you, the basic principles of this systems can be used to create a vertical system connected to a standard power supply. If you are looking to build big aquaponic system with the capacity to feed your family, take a look at this yard-size aquaponic setup by Shawn Paul of MorningStar Aquaponics. Like many aquaponic projects, this one uses IBC tanks cut in half. It is a complex system, with two large fish tanks, six grow beds and big biofilters. The piping for the system is quite elaborate and most of it runs underneath the tanks, which stand off the ground supported by concrete bricks. Every water outlet is equipped with a spigot, which enables manual control of the water flow. The water is drained through bell siphons. When this video first appeared about five years ago, it went viral among gardeners and aquaponic enthusiasts, earning it over one million views. Rik Kretzinger offered a glimpse into his Arduino-controlled, fully automated, lush aquaponic garden, which he manages from a small attic room via the internet connection. Although the video is not a tutorial, things are explained quite in detail, and if you are brave you can go on and try to replicate it. Otherwise, you could first give he tRik’s simpler project a try, to get a hang of the Internet of Farming magic on a smaller scale first. Check out our last example below. Inspired by the feedback he received for the video above, Rik Kretzinger decide to create a smaller-scale project detailedly described in a tutorial, to bring his automatization technique to a broader audience. 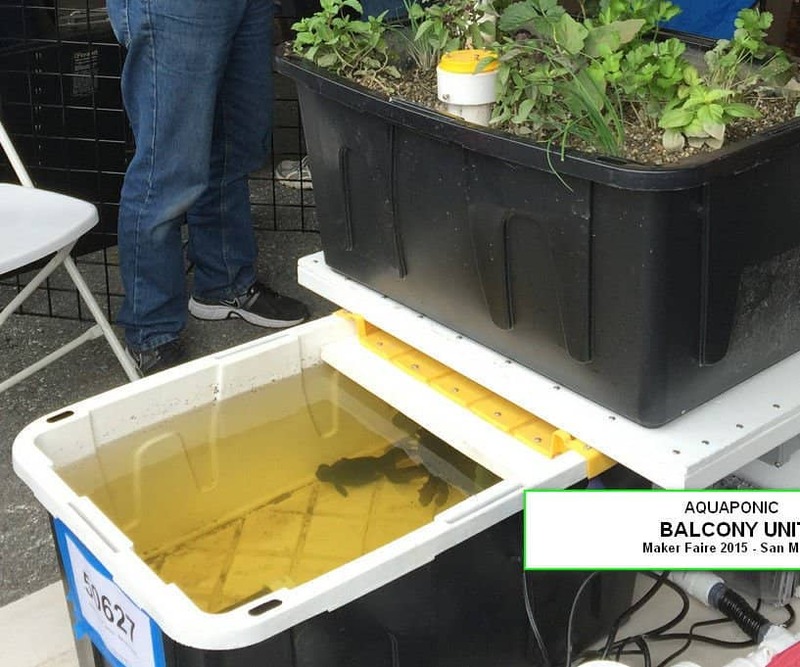 The automated aquaponic balcony garden is equipped with a bioreactor that most small scale projects lack, and it all works with the help of Arduino microcontroller, using the IoT (Internet of Things) principle. What about you? Have you ever set up your own aquaponic system? Did you start with a modest desktop setup, or went for a more advanced system from the start? What are your impressions on my selection of DIY aquaponic projects? We would love to hear from you, so please post a comment if you’d like to share your valuable experience with the community!